As regular readers here know, The Union stepped in proverbial “you know what” when it hired George Boardman as its weekly columnist. It seems to be aimed at hanging on to its core demographic — aging and declining — at the expense of gaining new readers. Like some former publishers, George is using his weekly column as a “bully pulpit,” speaking largely for himself. He’s also ill informed and out of touch. It’s proven to be an unproductive exercise — worse than I thought. The stakes keep getting higher for The Union too in its challenge to grow revenues and readership. In its latest cost-cutting move, the newspaper plans to outsource its printing “off the hill” to the Sacramento Bee — for the first time in 150 years. “Contact the Bee promptly with any shortages,” states the job description for a “dock supervisor” that is now posted on its website. The Union needs to figure out how to grow its business faster. Now this morning George pits “electeds” against each other (at least in his own mind). He writes that Grass Valley Mayor Jason Fouyer is being “proactive” because he attended a meeting to create a large western Nevada County recreation center. Then he calls that “quite a contrast” to Supervisor Ed Scofield, who recently wrote that leadership means “finding the funding” and leadership needs to come from “organizations and citizens with the passion to create the vision.” (Scofield was responding to a Boardman column in a polite fashion). George shows a real misunderstanding of the process, not to mention an ongoing petulant tone. In short, what Fouyer and Scofield are doing and saying are not mutually exclusive. They both are doing the “right thing,” at least in this case. George also is off base about the Rood Center’s role in community decision making, as shown by the response from the “Save Our Bridge” participants, ranging from Doug Moon to Hank Weston. In fact, the “Save our Bridge” campaign was one of the most nonpartisan acts of collaboration I can remember for our western county. It’s widely praised, from conservatives and progressives alike in our community. Since it’s the start of a new week, here’s a “scoop” that further suggests that our electeds, including the supervisors, can be “proactive,” to use Boardman’s words. My sources tell me that the supervisors, or at least one of them, will soon announce a plan for a measure to extend the county library tax — known as “Measure C.” It would be up the voters to decide. I’d support that. The money will be well spent: to continue to support our libraries throughout the county. The Madelyn Helling Library also has a collaborative technology center, showing that it is keeping up with the times. Measure C was originally passed by Nevada County voters in 1998 for five years, and was passed again in 2002 for a 15-year extension. The eighth-cent library tax is set to expire on September 30, 2018. Some background is here. This goes well beyond attending a meeting to show collaboration and leadership. It’s proactive too. It is time for The Union to rethink its one-year-old experiment with George Boardman as a weekly columnist. It just isn’t working out. We are neither being “informed” nor “delighted.” And he just can’t get his facts straight. It merely undermines the newspaper’s credibility when it needs to be bolstering its readership. Editor’s note: Here we go again: another uninformed column by weekly columnist George Boardman drawing an “Other Voices” in The Union. It’s endless. Think of all the ink and paper that is wasted from publishing his column and then having to publish the counterpoint. How utterly unproductive. Where’s the RL Crabb cartoon on “Bored Georgeman”? LOL. “George Boardman’s portrayal of organic farming as food grown for indulgent yuppies and not worth the extra money is an outstanding example of not understanding the subject of GMOs whatsoever. “The main reason the public wants food labeled is because of the amount of herbicides and pesticides that are sprayed on GMO crops. “Many of those chemicals remain on and in the food that goes to kitchen tables all over the world. “1. Organic farming practices are safer for the water, air, soil, farm workers, farm families, all animals, bees, adjacent towns and especially children and pregnant women. “We are all paying extra for the fallout from GMOs. “2. The weeds that are being sprayed are now superweeds— resistant to the herbicides, requiring heavier use or stronger poisons further affecting the environment. “3. The GMO companies produce patented seeds that farmers are not legally allowed to save without paying again and they manufacture the herbicides and pesticides that go with them. The Union continues to show it has a lock on the curmudgeon and ignorant demographic with a mind-boggling column by George Boardman, its paid weekly columnist, in this morning’s newspaper. A parody website now calls this guy “Bored Georgeman” – no wonder. This time The Union columnist manages to ridicule the newspaper’s readers in Nevada City, along with the local farmers, farms and businesses who produce or sell local and organic food (including the BriarPatch and Michael Funk’s United Natural Foods) — all in one swipe. “The vast majority of feed given to dairy cows in the U.S. is made from GMO corn, soybeans and alfalfa, and 80 percent of packaged foods contain GMOs,” Boardman writes. “It’s unlikely any of this concerned our neighbors who gathered recently on Commercial Street in Nevada City to indulge themselves at the second annual Farm to Table Banquet, a celebration of the local effort to produce organic food and a benefit for the Commercial Street Music Fund and music for the First Friday Art Walk. This year’s meal, which featured a flat-iron steak (grass-fed, of course), was priced at $75 a plate, plus an 18 percent gratuity and a $5.86 fee on top of that — over $94 to dine on an asphalt surface infused with grease and oil. Alcohol was extra. Here are the facts: Besides being a fundraiser (at a price comparable to other local fundraisers), the banquet supported our local farms, farmers and small businesses: Nevada County Free Range Beef, Riverhill, Blue Bird, First Rain, Dinner Bell, Soil Sisters, Super Tuber and Mountain Bounty, among others. The participating restaurants included Matteo’s Public, Three Forks Bakery & Brewing Co., Nevada City Winery, Treats Ice Cream and The Fix. (The Fix is owned by the family of our local Olympic hero, Evan Strong). The banquet was a sellout for the second straight year. It was a great community accomplishment; others would struggle to match it. In fact, the same people participating in the banquet do just that! BriarPatch regularly has donated organic chicken — 1,000 pounds of it at once — to the Food Bank of Nevada County to help feed the hungry. So does United Natural Foods Inc., founded by local resident Michael Funk of Nevada City. The details are here and here. The BriarPatch also gave a grant. 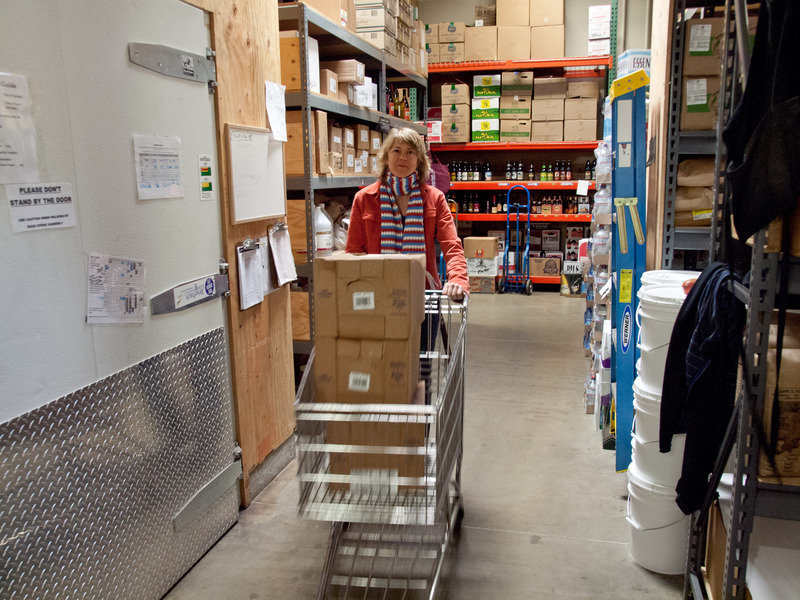 The Food Bank is one of few food banks that offer organic and sustainably grown products. But wait, there’s more. Nevada Union High is now offering fresh food from local farms in the school cafeteria. 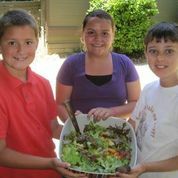 “We are working closely with local farms to secure produce that is grown locally and regionally; this means students can expect colorful summer vegetables when they begin the school year, crisp apples as they enter autumn and savory root vegetables as they turn the corner into winter,” the school writes. All told more locals, including the homeless, are eating organic products, much of it produced by locals. What’s wrong with that? The community-wide complaint about Boardman is that he never does his homework, shooting from the hip with strident views. Here’s an example from this morning of what we can expect from The Union’s new editorial board: Tea party supporter Nancy Garcia rebutting progressive Nancy Eubanks’ column: “Whose freedom is being tread on”? “(Publisher) Jim (Hemig), it appears that your premise is that by picking the most extreme views it will create balance, to which I don’t agree. Extremeness is not a point of view. If you seek balance then you will need to find people who experience the different conditions people face in this county, instead of its newsworthy activists. Why can’t The Union columnist Boardman get public officials to talk to him? I feel sorry for subscribers of The Union. As it turns out, the community newspaper’s weekly columnist and member of The Union’s editorial board can’t find a way to get our local public officials to talk to him — in a small town, no less. “When contacted by The Union, Supt. Louise Johnson and two trustees declined to comment, and the district has yet to respond formally to the report,” George writes in his column this morning. “(School board trustee) Klauer didn’t respond to a request for comment,” he adds. Inside the “sausage factory” of journalism, this one-way street of communications is a “red flag” to editors that a staffer, or in this case, a columnist has a reputation for being unfair. It means it’s time for “sit down” to discuss news-gathering practices. I guess The Union’s management hasn’t got the memo. But if they’re worried about their community perception and relevancy, they ought to ask around. It’s becoming an open secret. Author jeffpellinePosted on June 30, 2014 June 30, 2014 Tags George Boardman, The Union1 Comment on Why can’t The Union columnist Boardman get public officials to talk to him?